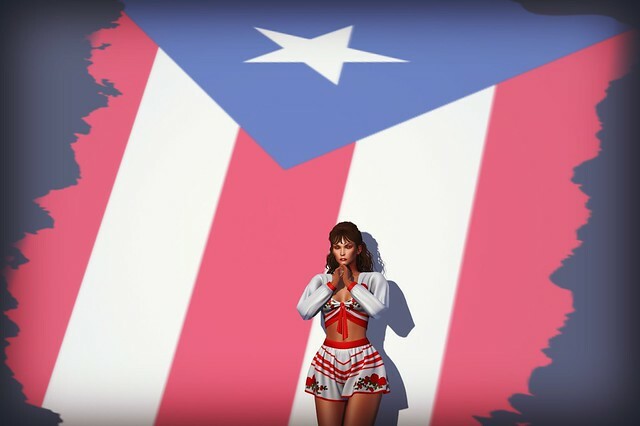 As I am sure I have written about before, I am Latina in RL (Puerto Rican to be specific). As a result, my musical preferences are pretty varied but they *always* include Latin tunes. Thanks to Despacito this has been a summer of Latin Pop and Reggaeton! My son and I can’t get enough of Despacito (and can be caught singing along rather loudly in the car) and a few other Latin hits so naturally I was inspired to create the SL version of me enjoying Despacito! I have a special treat for you today! More machinima! I know that is just what you wanted. 😉 I reblogged a link here on my blog to Xiola Linden’s machinima project in honor of Second Life’s 12th birthday and I have finally made my video after seeing a great deal of inspirational ones made by other residents. Being a fashion blogger at heart I have to share with you that I am wearing some of the latest from Legal Insanity: the Jaelle top (birds) and Baylie capris (old jeans jewels). Both items come in a wide array of options. I love the look! Thank you for reading and watching my machinima! The “What Second Life Means to Me” Video Share Project.